*If you are interested in trading with Bookmans, you must contact a Bookmans store directly to speak with a buyer. We cannot offer information on trade items online. 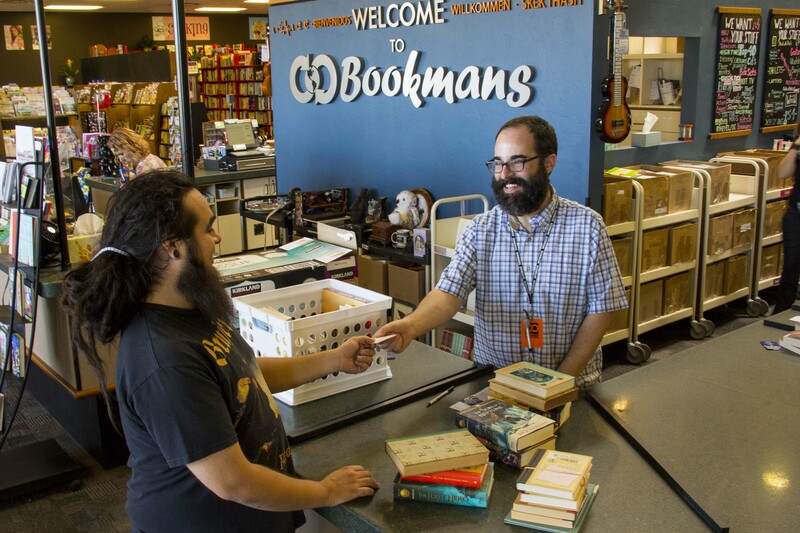 If you’ve ever visited a Bookmans store, you’ve seen the ever-buzzing trade counter and heard the roar of people getting cash and the ever-loved trade credit at our counters. Our inventory is primarily based on the things that you bring us – neat right? With all the interesting things that come across our counter, Bookmans is notorious for housing the weird, funky and amazing! With that in mind, we wanted to let you know what things we’re looking to buy, and in turn, the coolness that will be in our store for you to enjoy. The more you bring in the more cash – or trade credit – you’ll have in your pocket. Across our stores, we rallied our troops to find out what they are looking to buy as we move into the new year. Have any of this stuff you want to part with? Bring it in! Each of our stores is always looking for the current titles in books, movies, video games, and magazines. As we make way into a new year of book reading and geeking out all of our Bookmans locations are looking for popular and new young adult fiction and general fiction titles. We want to bring our fans the best of the best so if you have a hot new novel or video game that you’ve already gushed over, bring it in and let us give you the gift of getting something even more awesome in return… (trade credit or the cash money we mentioned, #obvi). Frequent our Eastside location on Speedway and Wilmot in Tucson? Bookmans East is currently keeping their eyes peeled for gaming systems and accessories, housewares and home decor in good condition, and jewelry. To add to their already amazing collection, they are seeking pop-rock CDs, vinyl, and musical instruments. All stores can’t get their hands on enough good vinyl, so bring in the crates you found in the garage. Add to the list Harry Potter books, books by Neil Gaiman, and New York Times Best Sellers list books. We would love to sink our teeth into some obscure non-fiction as well, so add that to the list too! Bookmans Phoenix is eager to buy retro gaming systems and games, new generation video games, packaged toys, and current titles of books, music, and movies. Our friends up in Mesa are looking for the same, and are hoping to see Blu-rays, crafting items (that bin of yarn and stamps has got to be put to better use), working electronics, and best-selling books. Midtown and Ina in Tucson and the Flagstaff stores are in the same boat. They want the hottest reads and new movies to stock their shelves. We are always hoping to come across the interesting things you bring us – from recreational equipment to vintage decorations. Our fans keep us alive by helping us provide the silly and amazing to our customers. Have a cool art print you want to part with? Thinking of selling that book series that you found in Grampy’s basement? Bring them in. Box sets and posters? Bring them in. Vintage toys and collectibles? Yep, bring those in too! By offering trade or cash, we hope to make your Bookmans shopping experience better in the long run. This system allows us to offer the best of the best and be your one-stop shop for all things entertainment. We are ready to get back to the grind and work overtime to make sure we have what you need – both in-store and online – to make your new year awesome (like this and all our other fantastic blog posts).